← surrounded by things, obsessed ? Paying attention to attention, is what Gay Watson has set out to do here. Acknowledging the current fad for ‘mindfulness’, she nonetheless suggests we do not fully understand how we can or might pay attention to the world we live in, and throughout the 300 pages here explores this from a number of angles, including interviews with artists and creators, discussions of neural networks and artificial intelligence, and Buddhism. In fact there’s a lot of Buddhist terminology here, much of which makes little sense if one is not a practitioner. 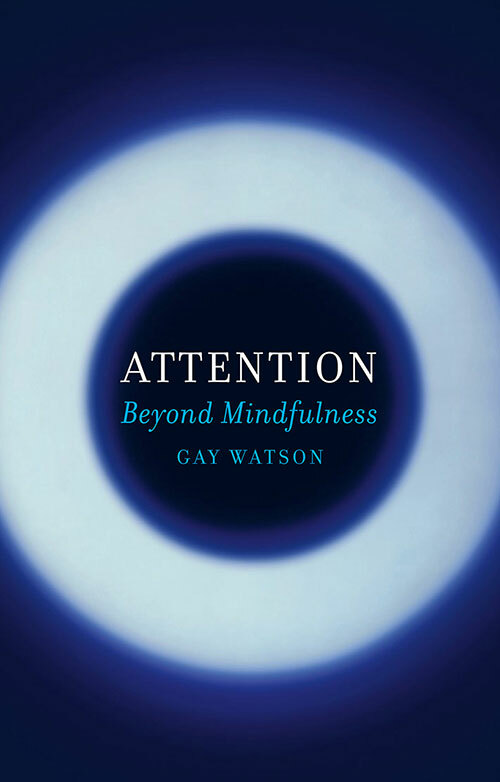 What lets the book down in fact is that much of the interesting writing and content here is shoehorned into a pre-existing framework: it seems Watson wants from the word go to show that Buddhism is how one pays attention. This is sometimes disingenuous, for the likes of photographer Garry Fabian Miller, composer John Luther Adams and ceramicist Edmund de Waal, draw on other spiritual traditions and ideas of place, listening and paying attention. The jump from the actual interviews to Watson’s ‘well, there we have it’ (I paraphrase) is often jarring and unsympathetic, if not downright misrepresentative. I’d have liked to have seen the interviewees’ informative and interesting ideas left to stand for themselves. The neural science too, sometimes seems a little misleading too, so much so that I spoke to a friend who works in programming and artificial intelligence for a second opinion. He suggested that there is a lot of dodgy material out there, a kind of pseudo-science which draws on academic research but then drifts off into new age, religious mysticism and psychotherapeutic fields. This isn’t wrong in itself of course, but to present some of the ideas here as ‘proven science’ isn’t quite right, they are interpretations of said science. I sound negative, don’t I? Well, I am in some ways. But I asked for a review copy of this book because I am interested in the idea of paying attention to the world we live in and experience, and I was drawn to the list of interviewee’s names, many of whose work I know, some who I know in person. I’m grumpy and conservative (with a small ‘c’) about many things, but I also try to accept change. There is little in Watson’s book to suggest that it is okay for brains to rewire themselves, for new ways of learning to exist, for us to find new strategies to filter and cope with the flood of information around us, for society and humans to evolve and change. For many of us, meditation and an idealised zen state is not possible or desirable, cannot and will not be the answer. Giving attention to each other, to the world, to ourselves, is of course important – perhaps more important than ever, as are creativity, philosophy, psychology, science and reflection. But they don’t need pigeonholing like this; the matter of attention deserves a more open and flexible approach, a more informed and generous type of attention. This entry was posted on 5 July, 2017 in homepage and tagged Rupert Loydell. Bookmark the permalink. A very interesting review on that book. I am working to design a workshop on attention, I thought it would add value to me. What do you think? especially the science behind it, that is my approach in training. Do you have any other recommendations?